Summary: We report a case of intrathecal methotrexate neurotoxicity manifesting as left arm weakness and aphasia. Diagnostic imaging showed restricted diffusion and fluid-attenuated inversion recovery imaging findings were normal at presentation. Three weeks later, diffusion abnormalities resolved, and T2-weighted studies showed increased signal intensity of prolonged T2 changes in areas of prior restricted diffusion. We attribute the clinical and radiographic findings to cytotoxic edema secondary to intrathecal methotrexate. Intrathecal methotrexate is an essential component of chemotherapy for acute lymphoblastic leukemia and is effective in preventing recurrences of central nervous system leukemia. Although the hematologic and mucocutaneous toxicities are dose limiting, its neurotoxicity is especially worrisome because the adverse effects may be more severe and irreversible, especially in patients undergoing cranial irradiation (1). Herein we describe the clinical and neuroimaging features of an adolescent patient with acute lymphoblastic leukemia who presented with central nervous system toxicity after the third weekly injection of intrathecal methotrexate. Pre-B acute lymphoblastic leukemia was diagnosed in a 13-year-old girl when she presented with thyromegaly, jaundice (total bilirubin 4.9 mg/dL), pancytopenia, and transaminitis (alanine aminotransferase 3140 U/L and aspartate aminotransferase 3070 U/L). Viral and collagen vascular titers were nonreactive. CSF was acellular, and the cytospin did not show any lymphoblasts. Cytogenetic analysis of the bone marrow blasts showed only normal metaphases. The leukemia remitted after induction chemotherapy (daunorubicin, asparaginase, and prednisone vincristine was not administered because of hyperbilirubinemia). During the consolidation phase of chemotherapy, approximately 6 hours after the third weekly intrathecal injection of methotrexate, the patient was admitted for the evaluation of left upper extremity paresthesias and weakness and drooling. Neurologic examination in the emergency department revealed confusion, inability to speak, difficulty writing, and complete (0/5) weakness throughout the entire left arm and hand. Examination of the sensory system was normal, and the reflexes were symmetric with negative Babinsky responses bilaterally. CSF analysis was consistent with arachnoiditis (32 white blood cells [20% polymorphonuclear cells, 70% lymphocytes, 9% monocytes, and 1% macrophages] and 0 red blood cells). CSF glucose, protein, and homocysteine levels were normal. Bacterial, Lyme, mycobacterial, and viral cultures were sterile. This initial episode resolved completely within several hours. About 20 hours later, however, she had a second episode of confusion and slurred speech. At that time, motor examination showed marked left hemiparesis with involvement of the arm more than the leg. Sensory and reflex examinations were unremarkable. 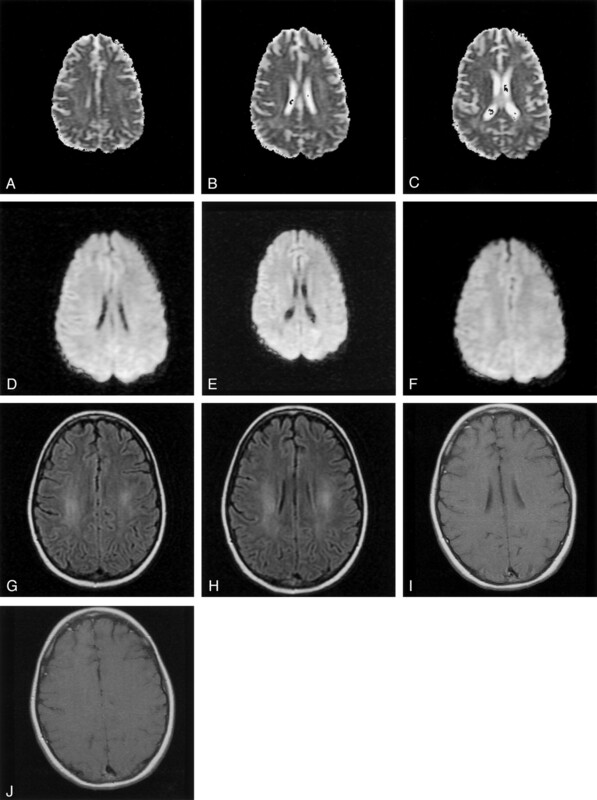 The weakness worsened during MR imaging of the brain, which showed the presence of restricted diffusion in the centrum semiovale of the posterior frontal and parietal white matter bilaterally and splenium of corpus callosum (Fig 1A–C [apparent diffusion coefficient, ADC] and Fig 1D–F [diffusion-weighted imaging]). The T2-weighted images (mixed density T2-weighted fast spin echo and fluid-attenuated inversion recovery) showed no abnormality (Fig 1G and H). Her symptoms almost completely resolved within 2 hours. Routine electroencephalography performed within hours of the onset of the second episode showed mild diffuse background slowing. Seventy-two hours of continuous electroencephalographic monitoring yielded normal findings. By the next morning, findings at neurologic examination were completely normal except for minimal left arm weakness manifested by a trace drift, which resolved. The fourth intrathecal methotrexate of consolidation therapy was omitted, and she continues to receive antileukemia therapy (including intrathecal methotrexate) without recurrence of neurotoxicity. 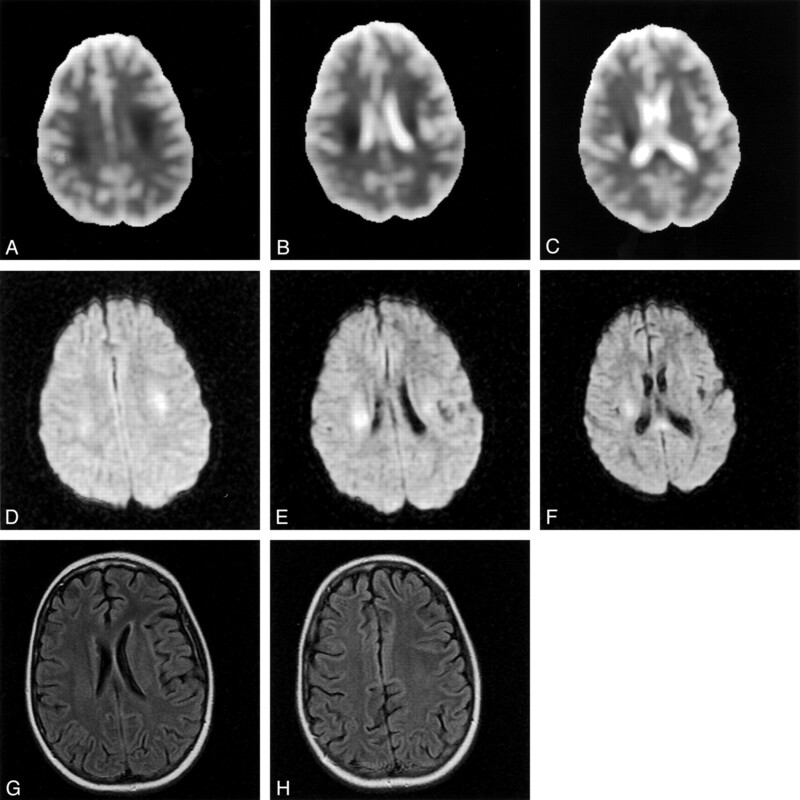 Three weeks after admission, the diffusion abnormalities normalized (Fig 2A–C, ADC; Fig 2D–F, diffusion-weighted imaging). T2-weighted studies showed increased signal intensity of prolonged T2 changes in the same areas where the prior diffusion-weighted study showed restricted diffusion (Fig 2G and H). The postgadolinium sequences showed no enhancement (Fig 2I and J). At presentation, ADC maps (A, B, and C) and diffusion-weighted images (D, E, and F) showed restrictive diffusion in the frontoparietal white matter and splenium of the corpus callosum. T2-weighted fluid-attenuated inversion recovery images (G and H) are normal. Three weeks after presentation, the ADC maps (A, B, and C) and diffusion-weighted images (D, E, and F) have normalized. No restricted diffusion is seen in the white matter. Fluid-attenuated inversion recovery images (G and H), however, now show prolonged T2 changes in the areas of prior restricted diffusion. The postgadolinium sequences (I and J) show no enhancement. Acute neurotoxicity is observed in 5.8–18.4% of children undergoing therapy for acute lymphoblastic leukemia and is associated with the intensification of chemotherapy (2, 3). The neurotoxicity usually manifests as seizures, occurring a median of 10–11 days after intrathecal methotrexate with or without cytarabine and hydrocortisone. Our patient presented with upper extremity weakness and aphasia and arachnoiditis shortly after intrathecal methotrexate, and neuroimaging showed transient restricted diffusion and no evidence of leukoencephalopathy. The child’s hemiparesis correlated with the involvement of the corticospinal tract in the corona radiata. Her language disturbance is best explained by altered mental status due to bifrontal involvement. That our patient now tolerates intrathecal methotrexate may be best explained by the frequency of the intrathecal injections. During consolidation, she was receiving weekly injections, and this schedule may have caused metabolic derangements (ie, folate deficiency and elevated homocysteine). During maintenance, intrathecal methotrexate is given every 3 months, and this schedule may allow for correction of metabolic abnormalities. It is interesting to note that dextromethorphan, a noncompetitive antagonist of the n-methyl-1-aspartate receptor, was administered to five children with severe subacute methotrexate neurotoxicity. All five children had resolution of their symptoms (4). Metabolic derangements resulting from methotrexate-induced folate deficiency may explain the neurotoxicity observed in patients so treated. Quinn et al (5) hypothesized that elevated levels of homocysteine and its excitatory amino acid neurotransmitter metabolites (homocysteic acid and cysteine sulfinic acid) may mediate, in part, methotrexate-associate neurotoxicity. They found elevated levels of homocysteine and neurotransmitters in patients exposed to methotrexate as compared with control subjects, and the highest levels of these compounds were observed in those patients with neurologic toxicity at the time of lumbar puncture. Davidson et al (6) showed low choline-water ratios by using proton MR spectroscopy in children receiving high-dose intravenous methotrexate. They postulated that choline depletion might reflect subclinical disturbances of myelin metabolism as a result of methotrexate therapy. Our patient had evidence of arachnoiditis on CSF analysis, and metabolic profiling of the CSF did not show elevated levels of homocysteine. The MR imaging changes seen in patients receiving methotrexate may be foci of demyelination or microinfarction. The mechanism of the changes may represent metabolic effects, increased capillary permeability, transient vasospasm, small vessel occlusion, or the demyelinating process itself (7). In the case of our patient, cytotoxic edema is the likely cause of her symptoms and the associated diagnostic imaging changes. Cytotoxic edema may be related to late swelling of glial cells. Single photon-emission tomography has been used to identify brain perfusion defects in patients treated for acute lymphoblastic leukemia. Harila-Saari et al (8) found abnormal brain perfusion in 44% of patients. These patients were younger than those with normal perfusion and had received more frequent intravenous methotrexate infusions. In evaluating a child with akinetic mutism following high-dose intravenous methotrexate, Karabacak et al (9) observed abnormalities in white and gray matter blood flow. White matter changes at MR imaging have been detected in children during and after therapy for acute lymphoblastic leukemia; however, the significance of these findings is unknown. In our patient, restricted diffusion was present in the bifrontal corona radiata and splenium of the corpus collosum, which resolved 3 weeks after the patient presented with neurologic symptoms. Only slight white matter hyperintensity was observed, primarily on fluid-attenuated inversion recovery images, in the area of previous diffusion abnormalities. Intrathecal methotrexate can result in reversible neurotoxicity. Cytotoxic edema may best explain our patient’s clinical and radiographic findings. Accepted after revision April 12, 2003.